Wrestling with the iPad’s manual file-sharing capabilities feels positively antiquated in the day and age of services like Dropbox. Fortunately, Ecamm Network’s new Mac application, PadSync, aims to help out by adding automatic syncing capability to the iPad’s file sharing. PadSync piggybacks on the iPad’s existing iTunes-based file-sharing technology, but it can figure out whether the more recent document is on your iPad or your computer, and then synchronize your files so that version is on both devices (it uses the modification dates to determine which is the newer version). When you plug in your iPad for the first time, PadSync will display a list of apps installed on your iPad that support file sharing. Click on any of those in the left-hand pane and the right-hand pane will show you the files associated with that app in either list or icon view, the latter complete with thumbnail previews. You can double-click any file to open it in the respective application on your Mac. Once you’ve synced the files, you’ll always have access to those documents on your Mac—and whenever you launch PadSync, PadSync will sync the most recent version to both devices. If there’s a conflict between the two, PadSync will even alert you and prompt you to choose which one you want to use. While PadSync is pretty bare bones right now, the developers at Ecamm assured me that it’s just a starting point and that they already have a number of plans for subsequent versions. 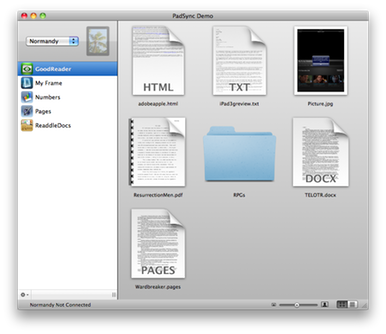 PadSync 1.0 is $10 and requires Mac OS X 10.6 or later and iTunes 9.1 or later. You can download a fully functional seven day demo from the company’s Website.